Every winter on the Chilliwack River, also known as the Vedder, many anglers brave the cold to take part in the steelhead fishery. Among all steelhead streams in the Lower Mainland, this river is the most productive one. Between early December and late May, several thousand so-called steelies make their way into the Vedder. Like salmon, they spawn as they sexually mature in the river, but they usually survive from the spawning process and return to the ocean for another cycle. Unlike the fall salmon fishery, steelhead fishing requires a bit more investment in time, patience and skills. This comprehensive guide is designed to assist those who would like to try out this fishery. This article covers regulations, techniques and general etiquettes that you should be aware of when targeting steelhead on the Chilliwack River. Beside steelhead, there are six other species that you might encounter while fishing on the Chilliwack River between December and May. All wild steelhead, trout and char (those with an adipose fin) are required to be released with care. 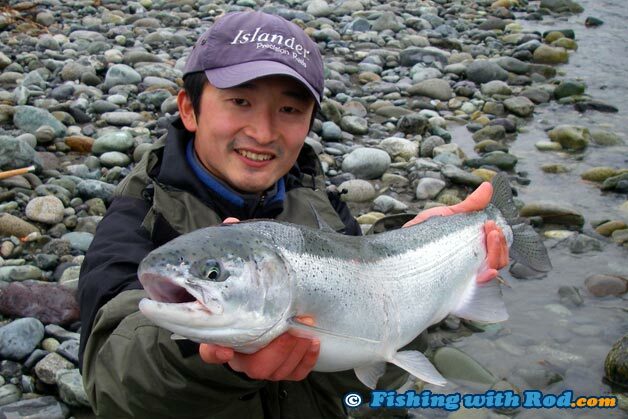 You can keep one hatchery-marked steelhead on the Chilliwack River each day. Once you keep a hatchery-marked steelhead, you must stop fishing for the day and mark your catch on your freshwater fishing licence. Finally, these regulations can sometimes change during the season so it is important to reread the freshwater fishing regulation synopsis and look for in-season regulation changes before going out. These rules may change at times, so It is important to check the regulations for changes and updates regularly. For fish that you have to release, please do so with care so their chance of surviving remains high. Because there are both species that you can keep and cannot keep in the Chilliwack River during this fishery, it is important to know how to identify all of them. Steelhead in the Lower Mainland typically weigh between 5 and 15lb, but few fish up to 20lb are recorded each year from the Chilliwack River. As the name suggests, their body is bright silver with a blue metallic back when they first arrive from the ocean. Like a coho and chinook salmon, they have small black spots across their back. Their entire tail is also covered with spots. The similarities end there. Unlike salmon, their tail is not forked. Instead, it is known as a "square tail". As they start sexually maturing, pink colour emerges on the gill plates and along the lateral lines. Bull trout belong in the char family, which are closely related to trout. They are much easier to identify due to a few distinct characteristics. Look for the white spots across the back. Pink spots can also be found along the lateral line. Most bull trout from Chilliwack River are caught in the upper sections of the river as they travel down from Chilliwack Lake. They can be as big as 10lb. Weighing less than 2 pounds, coastal cutthroat trout can often be confused with rainbow trout, especially in the estuaries where they lose most of their freshwater characteristics. In rivers and lakes, coastal cutthroat trout are very spotty from the back to the abdomen and have somewhat of a darker body colouration. The easiest way to identify them is by looking for a orange/red lining that is located below their gill plates. To effectively catch winter steelhead on the Vedder by float fishing, you want to keep your offerings in the strike zone. The technique is exactly the same as how you would target coho salmon, with a few modifications on your offerings. New anglers have a tendency to mistaken the strike zone as the depth where the fish are sitting. It is not. Salmonids look up and strike at the offerings just above them. Fish position themselves near the bottom, so the strike zone is usually 1 or 2 feet above the river bed. This technique does not only apply to the Chilliwack River, but also other Lower Fraser River tributaries. 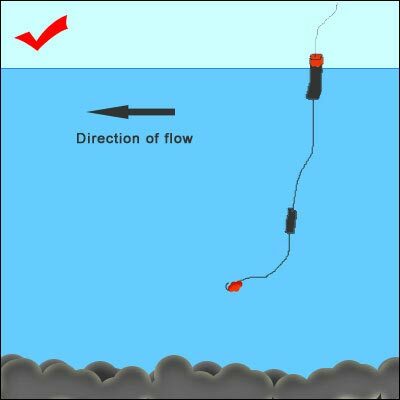 The diagrams below illustrate the correct and not-so-correct ways of float depth adjustment. For some reason, many people believe a longer leader would produce more fish, quite the opposite! Your hook will always travel faster than your weight in a river. By using a long leader, your hook and bait are lifted up higher from the river bed, away from the strike zone. You'll snag onto the bottom, and lose your weight, hook and bait. Even worse, you'll end up snagging a pink or chinook in the belly or tail, which can be time consuming to bring in and release. I usually like to keep my leader length (the line between the hook and weight) around 1.5 feet in length. Judging the depth by looking at the gradient of the river bank and the water, I adjust my float depth (the length from the float to the hook) so that it is about 1 to 2 feet shorter than the actual depth. When this is drifted, the bait will lift a few inches higher, remaining in the strike zone. When the float dips under the water, there is no hesitation as I don't need to question whether it is a snag or a fish. The hook is usually set hard and most of the time the fight is on. I find these adjustments would connect me into more fish in the past. The float size varies, small (11 grams) in clearer, slower water, while big (25 grams or more) in faster, deeper water. Tie on enough weight so only about 0.5 inch of your float (or the coloured tip) emerges on the water surface. This allows you to detect the bites sooner. 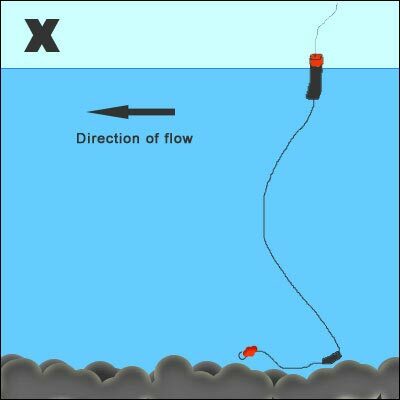 Keep your main line (the line between your rod tip and your float) tight enough without disrupting the drift. Always try to avoid having any line laying on the water surface. Keep the drifts short. A longer drift doesn't necessarily mean a bigger chance to catch a fish. Long drifts also cause inconvenience for nearby anglers. Avoid standing in the water, especially when you arrive at a new location. Undisturbed fish have a tendency to stay close to the river bank. Beside using roe as bait for steelhead, you should also experiment with dew worm, deli shrimp, prawn, ghost shrimp, roe sacs, single egg, pink worm, wool ties. Another productive alternative is to use a unweighted spinner instead of a baited hook. Unlike the fall salmon fishery, there are not as many steelhead returning so fish do not have a tendency to stage in schools. Instead, chances are you will not run into fish at most spots while encountering the odd ones after fishing for several hours if lucky. The success is much lower, but the thrill of having a powerful steelhead at the end of your line is well worth it. It is advantageous to move from one spot to another when fishing for steelhead. Avoid spending too much time at one particular spot unless you are certain that there are fish. You should also cover different types of spots because steelhead can be anywhere. When water visibility is low or fishing in early morning, you are likely to find a steelhead in 1 foot of water. When fishing for steelhead in a stream, it is considered rude to start just downstream from another angler who is already fishing. When approaching a run, always start from the head of it and work your way down so other anglers can have a chance to try it too. If other anglers are already fishing at a spot where you want to fish, then you should either move to a different spot or talk to them first. More likely than not, other anglers do not mind having you joining them.